Hair is a very important part of the human body which has a great cosmetic and emotional value. It plays a very big role in creating the look of the person, personality and overall presentation of an individual. With a beautiful and healthy looking hair, a person, whether male or female can transform his or her entire look and personality with a huge boost in the confidence level. But, hair loss is the most common problem faced by people, whether men or women in today’s world. In order to protect hair and prevent it from damage and loss one should know a few facts about the hair. A healthy person has more than 10,000 hairs on the head alone. Each hair strand goes through 3 phases. First is growing phase, then resting phase and the last phase is the falling out phase. In growing phase hair keeps on growing to a particular length. After some time it stops growing and remains as it is. This is the second phase i.e. resting phase. Lastly, after some time it falls off and makes a way for a new hair. This is a natural and continuous cycle going on in a person. Each growth cycle lasts for 2-6 years. Roughly, 50 to 100 hairs fall from the scalp each day while combing and washing them but the new hair take their place and maintain the hair volume. Hair is made up of protein. The volume, color and length of the hair are determined genetically in each individual. There are many factors which cause the loss of hair. Nutritional deficiency and health conditions like iron deficiency anemia and hypothyroidism are the most common factors precipitating the hair loss in general. In today’s time men are equally careful and conscious about their hair and overall look just as women. Everyone wants his crowning glory to be perfectly healthy and beautiful. Some useful tips for men for the prevention of hair loss are listed below. Wash hair regularly with a mild and gentle shampoo. Use a good hair conditioner after hair wash. Protect hair from harsh sunlight by wearing a cap. Wash hair every time after coming out of the swimming pool. Water in swimming pool contains high amount of chlorine. Chlorine can make the hair hard and brittle and can make hair easily break and fall down. To avoid this it is advisable to wash hair with a good shampoo each time you come out of the swimming pool. Be gentle with the hair. Always comb your hair with a good hair brush gently. Hard strokes with hair brush can cause hair fall and split ends. Include nutritious things in the diet. As the hair is made up of protein, lack of protein in the diet will cause the hair loss. To prevent this include yogurt, pulses, milk, soymilk and eggs and fish in the diet on a regular basis. Eat lots of fresh fruits and vegetables to maintain levels of zinc and Vitamin B12. Eat food items which are rich in the iron content to keep away from anemia. Dates, jaggery, green leafy vegetables like cabbage, spinach etc are known to contain good amount of iron and folic acid. Do regular and gentle massage in circular motion with finger tips on your scalp. Regular massage on head is known to increase the blood circulation in the scalp. This enhances the hair growth. 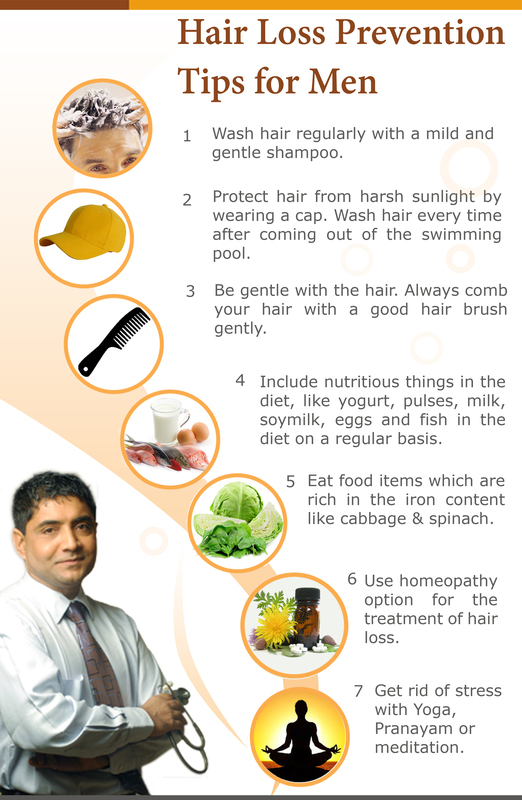 Use homeopathy option for the treatment of hair loss. Do not get stressed out excessively. Stress is known to play a significant role for hair loss. Do Yoga, Pranayam and meditation to get rid of stress. Do not subject your hair to frequent coloring. The colors may contain harsh chemicals which damage not only hair but also the follicles of the scalp from where the hair grows, resulting in the loss of hair. Get enough sleep. Research has shown that in order to maintain overall good health, human body needs 8 hours of sleep daily.